Good Tuesday afternoon to you! What a mess late lastnight and early this morning, as a MSC (Mesoscale Convective System) moved through our state. The complex of storms packed a big punch across the area, with strong winds, very intense lightning and very heavy rain. The rain was beneficial for many areas, but too much rain fell too fast in some areas, causing some big issues. In-fact, rain totals were reported over 4 inches in Jasper and Birmingham, with pockets of 6 to 7 inches embedded in a line from Jasper to Birmingham to Clanton. My rain total in Northport was right at 0.50”. The active batch of storms has moved off the Gulf Coast this afternoon, as the upper air disturbance continues to track around the outer edge of the ridge. The northwest flow aloft is weakening and shifting west of Alabama, so I don’t expect any big issues with storms over the next 24 hours. A stray storm or two is possible this evening and on Wednesday, but rain chances are at around 20%. There could be some foggy issues late tonight, so allow extra time on the roads late tonight or early on Wednesday. Look for lows to fall into the middle 70s tonight. We’ll introduce more sun in the forecast on Wednesday, with an afternoon high around 96 degrees. With high dewpoints and hot air temperatures, heat index levels will reach the 105 degree mark in many spots. The ridge will nudge east a bit and strengthen on Thursday and Friday, which will help to increase the northwest flow aloft over Alabama. As a few small scale features work around the eastern edge of the ridge, we can expect a round of showers and storms at any point on Thursday, Friday and Saturday. It will not rain all day or night, but a round of strong to severe storms is certainly possible. The main threats with any storms that develop Thursday through Saturday will include damaging winds, hail and intense cloud to ground lightning. Rain chances stand at around 40% for those days, but these chances may increase. The ridge west of Alabama will weaken late in the weekend and early next week, which will reduce the good chance of scattered storms. A few storms are still possible, but it will mainly be in the form of isolated afternoon storms. If you have plans to the beach over the next few days, look for the risk of a few scattered storms on Wednesday, with highs near 90. Rain chances will increase a bit on Thursday through Saturday, with the risk of intense storms at any point. It will not rain all day or night, so the beach forecast is looking fair. We can expect a partly cloudy to partly sunny sky Wednesday through Saturday along the Alabama Gulf Coast and northwest Florida Panhandle. Send us your weather pictures! Send them to weather@wvuatv.com. Also, look us up on facebook and twitter. 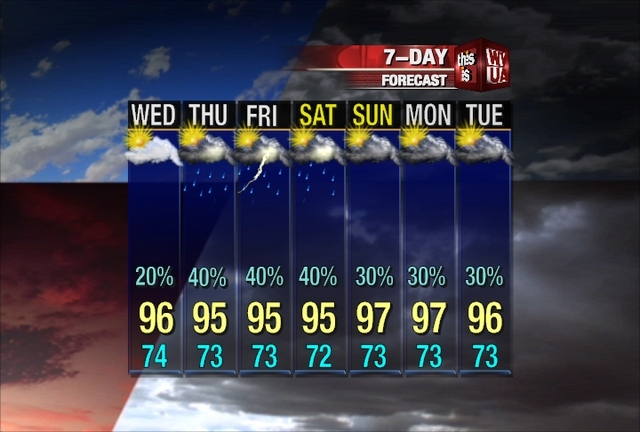 Like us on facebook by searching facebook.com/wvuaweather or WVUA-TV Weather. You can find us on twitter by searching weather@wvuatv.com or WVUA-TV Weather. Great way to get weather updates! Plus, facebook is a great way to send us weather pictures. Simply tag us! A TROPICAL WAVE WITH AN EMBEDDED AREA OF LOW PRESSURE IS LOCATED NEARLY MIDWAY BETWEEN AFRICA AND THE LESSER ANTILLES. SHOWERS AND THUNDERSTORMS ASSOCIATED WITH THIS DISTURBANCE HAVE BECOME SLIGHTLY BETTER ORGANIZED SINCE YESTERDAY. ENVIRONMENTAL CONDITIONS ARE CONDUCIVE FOR SOME GRADUAL DEVELOPMENT OF THIS LOW OVER THE NEXT FEW DAYS. THIS SYSTEM HAS A MEDIUM CHANCE…30 PERCENT…OF BECOMING A TROPICAL CYCLONE DURING THE NEXT 48 HOURS AS IT MOVES WESTWARD AT AROUND 15 MPH. Good Tuesday morning! 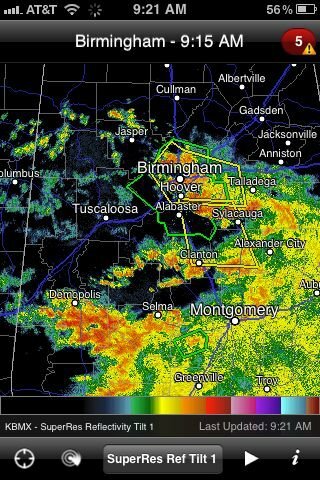 Here’s a 9:50am look at Radar across central Alabama. The strongest storms are over Marengo County, Jefferson, Shelby, Coosa and eastern Chilton County. While that’s the case at this time, these storms are moving out quickly and will continue it’s track southeast. There are now no severe thunderstorm warnings across west or central Alabama, as the storms have gone below severe limits. That being said, they are still producing lots of lightning, gusty winds and very heavy rain. Please use caution if driving on the roads because there are lots of roads under water; especially in Jefferson and Shelby County (Under a Flash Flood Warning). Radar estimates show rain totals of 6 to 8 inches across Jefferson and Shelby County, with 1 inch rains over much of central and west Alabama. I picked up 0.50″ at my house in Northport. Weather watcher Steve Rigsby got 4.05″ in near downtown Jasper. The upper air disturbance that helped to kick off this big mess is finally moving out. 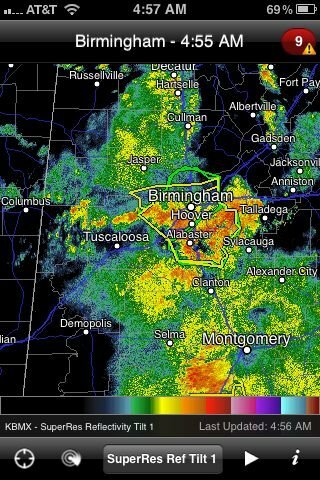 Look for the heavy rain and storms to move out over central and west Alabama by noon. 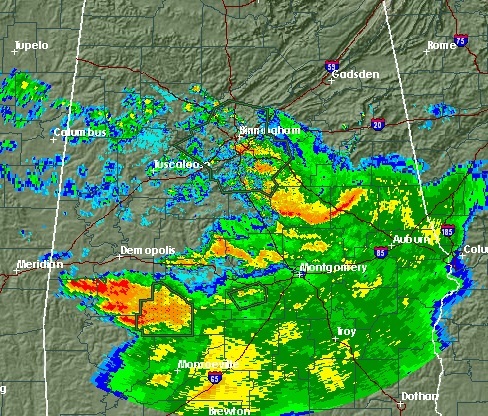 The heavy rain has already ended for areas north of Linden to Marion to Birmingham. This is for areas southeast of that line, where the storms are now. Behind this big batch of storms is scattered light to moderate showers. We can expect the risk of a few scattered showers and storms this afternoon and evening, but nothing like what we’ve had. Most areas should get some sunshine later today or this afternoon. Wednesday is looking pretty dry, with only the risk of a few afternoon storms. Highs will reach the upper 90s on Wednesday, with heat index values over 105. Also, expect a mostly sunny sky. Rain chances to creep back up to the 40% range on Thursday, Friday and Saturday. We’ll have to keep an eye on a possible MSC like we dealt with this morning, but the risk of that is rather low at this point. Good Tuesday morning! It’s been a long night across much of the area, with severe weather issues and flash flooding. There is significant flash flooding issued in Jefferson and Shelby County this morning, and isolated flash flooding in other parts of central and west Alabama. Please use caution when driving due to roads under water. Allow extra time to work or just on the roads. If you come across a flooded road, turn around! Above is the 9:20am Radar image. Storms are still moving across parts of central and south Alabama, but the strong to severe storms are gradually moving to the southeast. Look for the storms to calm down a bit across all of our area by lunch, with only scattered showers and storms expected for the rest of the day. The severe weather/flash flooding mess has been in response to an upper air disturbance. That feature is starting to move out of our area, so that should take most of this activity with it as the day moves along. Keep the rain gear handy! (4:17 AM) nwsbot: Local Storm Report by NWS BMX: 5 WSW Cordova [Walker Co, AL] trained spotter reports TSTM WND DMG at 01:35 AM CDT — numerous trees and power lines down along al hwy 269 near parrish. time estimated from radar. (4:20 AM) nwsbot: Local Storm Report by NWS BMX: Sumiton [Walker Co, AL] 911 call center reports TSTM WND DMG at 01:42 AM CDT — tree debris and powerlines down blocking main street in sumiton. time estimated from radar. (4:23 AM) nwsbot: Local Storm Report by NWS BMX: 3 WNW Tutwiler [Walker Co, AL] trained spotter reports TSTM WND DMG at 01:50 AM CDT — trees down blocking tutwiler road. time estimated from radar. (4:30 AM) nwsbot: Local Storm Report by NWS BMX: 5 SW Jasper [Walker Co, AL] trained spotter reports TSTM WND DMG at 01:35 AM CDT — trees down blocking kings mill road. time estimated from radar. (5:54 AM) nwsbot: Local Storm Report by NWS BMX: Haleyville [Winston Co, AL] trained spotter reports TSTM WND DMG at 12:45 AM CDT — several trees down in haleyville and the surrounding area. numerous power outages around the county. (6:29 AM) nwsbot: Local Storm Report by NWS BMX: 3 SSW Birmingham [Jefferson Co, AL] broadcast media reports FLASH FLOOD at 06:00 AM CDT — several cars stranded in flood waters on greensprings ave under the interstate 65 overpass. 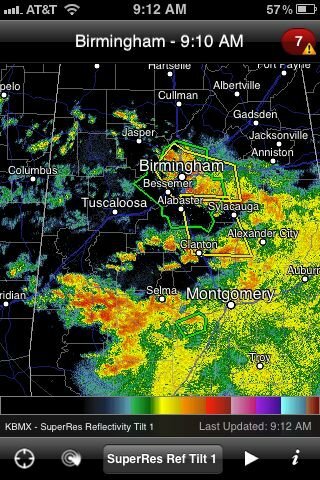 (6:32 AM) nwsbot: Local Storm Report by NWS BMX: 3 SSW Birmingham [Jefferson Co, AL] broadcast media reports FLASH FLOOD at 06:00 AM CDT — several cars stranded in flood waters on green springs hwy under the interstate 65 overpass. corrected for location. (6:48 AM) nwsbot: Local Storm Report by NWS BMX: 3 SW Mountain Creek [Autauga Co, AL] emergency mngr reports TSTM WND DMG at 03:15 AM CDT — tree down blocking the roadway on county road 20 west at the interstate 65 overpass. time estimated from radar. (6:57 AM) nwsbot: Local Storm Report by NWS BMX: 4 ENE Billingsley [Autauga Co, AL] emergency mngr reports TSTM WND DMG at 03:15 AM CDT — tree was down blocking the roadway near the intersection of county roads 24 and 19. tree has been cleared by the vfd. time estimated from radar. (7:34 AM) nwsbot: Local Storm Report by NWS BMX: Valley Grande [Dallas Co, AL] emergency mngr reports TSTM WND DMG at 06:15 AM CDT — isolated trees down in the northern portion of the county. (7:37 AM) nwsbot: Local Storm Report by NWS BMX: 3 N Alabaster [Shelby Co, AL] storm chaser reports TSTM WND DMG at 01:50 AM CDT — large gas canopy partially collapsed at the jet pep in pelham. time estimated from radar. corrected. (7:48 AM) nwsbot: Local Storm Report by NWS BMX: Blountsville [Blount Co, AL] emergency mngr reports TSTM WND DMG at 31 Jul, 12:40 AM CDT — multiple trees down across the county. (7:52 AM) nwsbot: Local Storm Report by NWS BMX: Lynn [Winston Co, AL] public reports TSTM WND DMG at 01:00 AM CDT — several trees down in lynn. (7:55 AM) nwsbot: Local Storm Report by NWS BMX: Bear Creek [Marion Co, AL] public reports TSTM WND DMG at 31 Jul, 12:30 AM CDT — trees down in bear creek. time estimated from radar. (8:00 AM) nwsbot: Local Storm Report by NWS BMX: 3 NE Hackleburg [Marion Co, AL] public reports TSTM WND DMG at 31 Jul, 12:25 AM CDT — trees down blocking the roadway on hwy 43 just north of the wrangler plant. time estimated from radar. (8:05 AM) nwsbot: Local Storm Report by NWS BMX: 4 N Alabaster [Shelby Co, AL] public reports FLASH FLOOD at 03:00 AM CDT — flooding reported at the belle vista mobile home park. (8:07 AM) nwsbot: Local Storm Report by NWS BMX: 5 N Alabaster [Shelby Co, AL] public reports FLASH FLOOD at 03:00 AM CDT — flooding reported at the pelham ymca. (8:11 AM) nwsbot: Local Storm Report by NWS BMX: 2 SSW Birmingham [Jefferson Co, AL] broadcast media reports FLASH FLOOD at 08:00 AM CDT — water rescue at the intersection of 6th ave south and 9th st south. * AT 905 AM CDT…THE NATIONAL WEATHER SERVICE INDICATED A LINE OF SEVERE THUNDERSTORMS CAPABLE OF PRODUCING DAMAGING WINDS IN EXCESS OF 60 MPH. THESE STORMS WERE LOCATED ALONG A LINE EXTENDING FROM PELHAM TO CHILDERSBURG…AND MOVING SOUTHEAST AT 40 MPH. * LOCATIONS IMPACTED INCLUDE…WILSONVILLE…COLUMBIANA…SYLACAUGA…TALLADEGA SPRINGS…CALERA…STEWARTVILLE…WEOGUFKA AND ROCKFORD. WINDS OF 60 TO 70 MPH WILL BREAK LARGE TREE LIMBS AND CAUSE SOME DAMAGE…ESPECIALLY TO SMALLER STRUCTURES. FOR YOUR PROTECTION…MOVE TO AN INTERIOR ROOM ON THE LOWEST FLOOR OF YOUR HOME OR BUSINESS. Good Tuesday morning! As of 5am, lots of rain is moving across parts of central and west Alabama, with a big batch of strong to severe storms moving to the southeast at 3o to 40mph. The final batch of strong to severe storms is about to imact places like Tuscaloosa and Northport around 5:30am, then continue south to imact HWY 80 between 6am and 8am. This is the second round of strong to severe storms much of the area has dealt with this morning, with the first batch south of Montgomery now. Behind the storms there’s a lot of light to moderate rain, with some lightning can be expected for a few hours. Along the line, expect intense lightning, heavy rain and strong gusty winds. The stongest storms are over Jefferson, Shelby and Chilton County, where there’s a severe thunderstorm warning until 6am. There are some big flash flooding issues along Interstate 65 over Jefferson and Shelby County, so please use caution when driving. 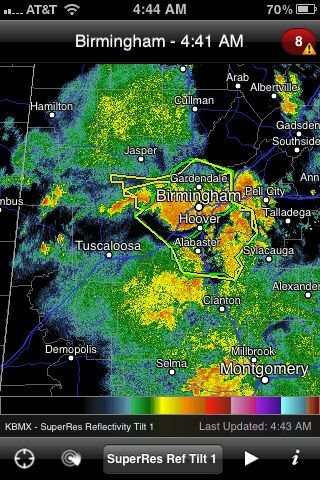 The rain hasn’t been heavy enough to cause any flash flooding issues over much of the west Alabama. Some areas southwest of Greensboro hasn’t picked up a drop yet. I still expect southwest Alabama to pick up some rain before the event is over today. Showers and storms will continue to increase in coverage as they spread south and southeast. If you have to drive this morning, take some extra time on the wet roads, especially in areas that has had wind damage and flash flooding. Most of the issues have been along a line from Hamilton to Jasper to Birmingham to Clanton. The upper air disturbance that has brought the rain to our area is about to move out later this morning, so I expect a gradual decrease in shower and storm coverage after 8am, with only the risk of scattered to isolated storms for the rest of the day. We’ll even get a little sun at times as we approach lunch and the early afternoon hours. Look for highs to reach the 90s today, as the sun returns this afternoon. Again, a few extra storms are possible later today and this afternoon, after this early morning round of storms moves on. * AT 436 AM CDT…THE NATIONAL WEATHER SERVICE INDICATED A LINE OF SEVERE THUNDERSTORMS CAPABLE OF PRODUCING DAMAGING WINDS IN EXCESS OF 60 MPH. THESE STORMS WERE LOCATED ALONG A LINE EXTENDING FROM MOODY TO LAKE PURDY TO ROSS BRIDGE TO OAK GROVE…AND MOVING SOUTHEAST AT 45 MPH. * LOCATIONS IMPACTED INCLUDE…PELHAM…CHELSEA…HELENA…ALABASTER…WILSONVILLE…COLUMBIANA…CALERA AND MONTEVALLO.